This self-guided tour covers all the same sights to which tour guides will take you. Print this page to take along and you're all set—and you can't beat the cost savings. 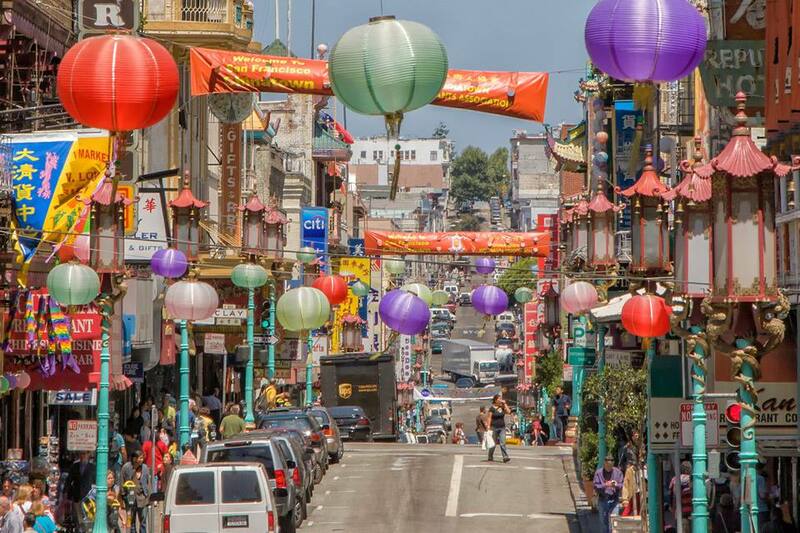 This walking tour takes you off the main streets into alleys and areas where you'll find some unique Chinatown sights. At a leisurely pace, it takes about 2 hours, including a stop for lunch. If you're a shopper, it may take a bit longer than that. The total walking distance is 1.5 miles, and it's nearly flat. Chinatown is woefully short on public restrooms. Your best bet is to find one before you go in. There's a Starbucks at the corner of Sutter and Grant, just a block from the Chinatown gate. Start at the Chinatown Gate: This 1970 addition to the Chinatown entrance marks the transition into Chinatown from Union Square. A pair of Chinese guardian lions is traditionally believed to provide protection. Called Shi in Chinese or "Foo Dogs" in the West, they're a common sight in front of Chinese Imperial palaces, Imperial tombs, government office, and temples. Walking on Grant Avenue: Grant is especially touristy near the Chinatown gate. It's a good place for souvenir shopping, with several large shops offering t-shirts and other trinkets. Further up the street, you'll also find modern Asian items that are both stylish and easy on the pocketbook. This part of Grant is a good place to stop and look up. This isn't a ploy to make you look silly: a couple of interesting things are above eye level. Look around and you'll see that the street signs are written in both English and Chinese and the ornate streetlights (put up in 1925) are supported by golden dragons. Stop at St. Mary's Church: Grant at California. The granite stones used in this historic church's foundations came from China and its bricks came "around the Horn" of South America with the gold seekers. It was the first church built as a cathedral in California and for many years was one of San Francisco's most prominent buildings. Inside is a small display of photographs from the 1906 earthquake and fire, showing both how badly it was damaged and how closely the new structure resembles its predecessor. Walking: When you cross the cable car tracks at California Avenue, listen. Not only will it help you avoid an approaching car, you'll also hear the cables that move the cars humming beneath the street. Stop at the Wok Shop: 718 Grant Avenue. This long-time Chinatown shop sells an extensive selection of cleavers, woks, and chopsticks, all of which make great (and useful) souvenirs. Stop at Eastern Bakery: 720 Grant Avenue. Opened in 1924, Eastern is the United States' oldest Chinese bakery. Mooncakes are their specialty, filled with a light melon or rich-tasting lotus-seed paste. Walking: At Clay Street, turn right, then go left to enter one of San Francisco's original city parks. Stop at Portsmouth Square: One of three city parks set aside by San Francisco's first mayor, Portsmouth is Chinatown's social center, with residents using it as an extension of their homes, taking the kids there to play or meeting friends. You'll sometimes find men playing Chinese chess (also called elephant chess) and groups of women playing cards. Also in the park is the Robert Louis Stevenson Memorial and a marker commemorating the first public school in California. The only public restroom on the tour route is in the park, but be warned—cleanliness can be an issue. Walking: Cross the park to Washington Street and turn left. Stop at the Old Telephone Exchange: (743 Washington) This lovely building is now the East West Bank, but it started out as the Chinese Telephone Exchange. Callers often asked for people by name only, thinking it rude to refer to a person by using a number, so the operators working here had to know each subscriber by name. With many subscribers having the same name, they also had to know everyone's address and occupation. And - they had to speak not only English but also five Chinese dialects. Today's building was rebuilt after the 1906 earthquake and fire. Walking: At Grant Avenue, turn right—or take a shortcut through Wentworth Place to Washington Street. Chinatown Restaurant Row: Between Grant and Kearny Street on Washington are some of the best-rated restaurants in Chinatown. Walking: After looking around or having a bite to eat, return to Grant Avenue. This route bypasses one of Chinatown's best-rated tea shops, Red Blossom. If you want to stop in, turn left on Grant to get there. Otherwise, turn right at Grant and continue. To Buy a Unique Souvenir: Talk to the folks outside the door at 924 Grant or enter through the nondescript lobby and you'll find a place to get one of Chinatown's most unusual souvenirs, a custom-made, carved stone stamp from Rainbow Sign and Art. Be Prepared for Game Birds: In the block between Pacific and Broadway on the right side of the street is a small shop called Ming Kee Game Birds. They sell birds used in Chinese cuisine, including a blue-skinned chicken. FYI: Several years ago, a lot of controversy arose over Chinatown shops selling live poultry and shop owners are still sensitive to gawkers and photographers. Walking: At Broadway, turn left. At Stockton, cross the street and turn left again, walking along Stockton. Explore the Chinese Markets: The next two blocks of Stockton are packed with markets. Some sell the same kinds of vegetables and groceries you'd find at a neighborhood store anywhere, but others sell fresh fish, Asian specialty vegetables, and foods. For fun people-watching, look for older Chinese women shopping, arguing over asparagus, wrangling over radishes or shaking an eggplant to see if it's firm. Stop at the Golden Gate Fortune Cookie Factory: (56 Ross Alley) It's not what you might expect of a factory, but more like a Wallace and Gromit invention gone awry. Some people think the staff rude, and they'll give about 30 seconds to look around before insisting you buy something, but it's worth a look and something you're not likely to see anywhere else. Bring cash if you want to buy some fresh fortune cookies and expect to pay to take a photo, too. Stop at the Sam Bo Trading Company: (50 Ross Alley) This small shop sells Buddhist and Taoist religious items, Buddha statues, incense and paper goods burned in tribute to ancestors and the gods. A pack of handmade paper printed in gold purchased here makes an inexpensive, beautiful souvenir. Walking: At the end of Ross Alley, go right on Jackson and then left into Spofford. Explore Spofford Alley: There's not a lot to see in this short alley, but listen: it's home to numerous mahjong parlors and you can hear the tiles clicking as you pass, especially on weekends when you might also get a glimpse inside through an open door. Walking: At the end of Spofford, turn left and walk to Waverly Place. Turn around at Washington to walk the street's two-block length. Explore Waverly Place is often called the Street of the Painted Balconies, but it wasn't built for tourists and these days the paint is growing a bit faded. Walk along its two-block length and you'll find a dry cleaner, travel agency, employment agency two funeral businesses and two temples. Amy Tan fans may recall the name Waverly from "Joy Luck Club," and Dashiell Hammett's "Dead Yellow Women" is also set here. Stop at the Tien Hou Temple: (125 Waverly Place) The smell of temple incense is one of Chinatown's sensory treats, and you'll find plenty of it on the top floor at 125 Waverly Place, in a temple dedicated to the Goddess of Heaven. After you climb the long stairway, you'll find a tiny, incense-filled room hung with red and gold lanterns, several shrines and a statue of the goddess in the back. They don't mind respectful visitors (but don't allow photographs). Admission is free, but I recommend making a small donation, just to be polite. Family Benevolent Associations: You'll see the offices for several of these associations on Waverly Place, including the Eng and Wong families. They began as social clubs to serve social and personal needs of Chinese workers and provide political and social support systems to newcomers. These days, they are mostly gathering places, particularly for older Chinese who live in Chinatown. Bing-Tong Kong Freemasons: During the early twentieth century, Bing-Tong Kong was one of San Francisco's most powerful Tongs, groups often compared to modern gangs. In the 1930s, it started using the name "Chinese Free Masons," but whether they are formally associated with that organization is unclear. This building appears briefly in the 1982 film Chan Is Missing, directed by Wayne Wang. Stop at the Clarion Music Center (816 Sacramento Street) sells Chinese drums, cymbals, flutes, Tibetan singing bowls and many unusual instruments and is well worth a stop if you like that kind of thing. They are closed on Sundays. The easiest way to get to many other parts of San Francisco from Chinatown is by cable car. Find everything you need to know about riding them in the San Francisco Cable Car Guide. If You're Done for the Day: Turn left at Sacramento Street and right onto Grant. Walk 3 blocks and you'll be back where you started. Sutro Media's San Francisco Chinatown app provides a map and an A to Z listing of points of interest. The map is filled with detailed icons, but unfortunately, they overlap and are hard to read on a mobile phone screen. If you're the type who likes to wander but occasionally wants to know more about something, you may find it useful. The free app City Walks provides minimal information and you'll have to pay for an upgrade to access their guided tours. It's a pricing strategy, this app rates only 2.5 stars out of 5, largely because of complaints that the free version has nothing to offer. Time Shutter - San Francisco is custom-made for history buffs and anyone who wonders what a place looked like long ago. Using their map- or list-based index, you can bring up historic photos of the place you're standing. Double-tap and they'll transform into modern-day views.